The bustle of show season is past, so Sheri is enjoying these quieter days. There are other good feelings from the shows, certainly. There’s the pride of taking ribbons, and the camaraderie of the community. There’s also the incredible opportunity to cultivate discipline and a sense of accomplishment in her daughter, Jamie, and son, Jacob, and other young people. And giving the same kind of support to others, like that she and her family received when they started showing. And giving veterans and ill and disadvantaged children a moment to shine, showing Sheri’s horses with whom they’ve been experiencing equine therapy. Sheri simply enjoys showing. “Horses are a pleasure. 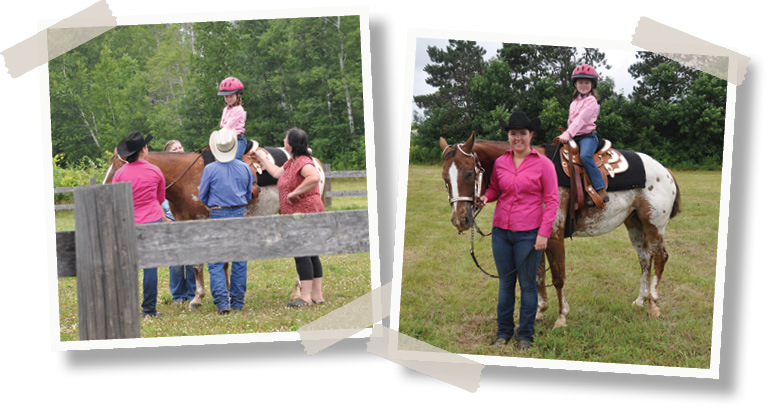 If you’re not smiling, you’re not doing it right.” Our featured photo shows Sophie, one of the children who was introduced to horseback riding by Sheri and her family. Sheri started riding when she was a child. Though her parents couldn’t afford horses, Sheri “knew every single horse for two miles,” and convinced her kind neighbors to let her ride. But she waited years for a horse of her own. And it came as a silver lining during a difficult time. At age 34, Sheri received a diagnosis of advanced breast cancer. On the way home from an exhausting treatment at the hospital, Sheri had to tell her almost-five-year-old daughter that Jamie’s upcoming birthday party just couldn’t happen. But the young mother wanted to offer something else special, and she asked her daughter what she wished for her birthday, besides the party they had to forego. Serendipitously, at that moment, Sheri was driving alongside a field where a horse and his trainer were at work. Jamie simply said, “Maybe I could just go for a ride on a horse.” They pulled over, and Sheri’s daughter’s birthday wish was granted on the spot. That joyous experience made a life-changing impression on everyone. Very soon, Sheri’s uncle felt inspired to buy the family their first horse. Both Sheri’s children started riding. The Boedekers have raised, trained, and shown horses for 15 years now. Today, they keep five horses, including Kelso. Jamie works part-time at an equine therapy center. Sheri works with her own horses, providing riding lessons and activity for individuals with PTSD and serious illnesses. As published in EquineMonthly, January 2018 issue. Learn more about Aspen Gold.